Have you been stuck at the same weight for what seems like forever? You think you’re eating “healthy" and nothing happens. That scale doesn’t budge. Or worse yet, your weight keeps slowly creeping up, ounce by ounce. It can be extremely frustrating when weight loss comes to halt, especially if you think nothing’s changed on your side. It happens to just about everybody -- and many people refer to it as a “plateau”, like it’s a magical state of being you can’t avoid when losing weight. But here’s the truth about what’s happening when you’re struggling to lose weight and nothing’s happening: It’s because you’re no longer in a calorie deficit. The amount of calories you eat are either the same as or more than your body burns, resulting in either no weight change or weight gain. That’s all that a plateau is. It's your body telling you're eating just a bit too much. Make no mistake. The bottom line is: calories DO count. Don’t let anybody tell you differently. If you are an otherwise healthy individual, you’re not losing weight because you’re eating too many calories for what your body needs. It’s like you’re overfilling your gas tank, and all that extra gas goes all over your car. Your body stores the extra calories as fat. Now, the quality of those calories also count. As does how you're eating, why you're eating and how consistently you focus on those things. But to get down to the bottom of things and make changes so you can lose weight (and feel great), it’s important to understand that the problem is too many calories IN versus calories OUT. Now, sure, you can exercise more so that you’re burning more calories. But here’s the thing: you can’t outwork a bad diet. Exercise should be a celebration of what your body can do; not a punishment for foods you ate. There are a few of different reasons why the scale isn’t budging. Digging in and understanding where you're going off course can help you start losing weight again. When you start a diet or healthy way of eating, you’re probably quite strict about counting your calories or portion sizes. 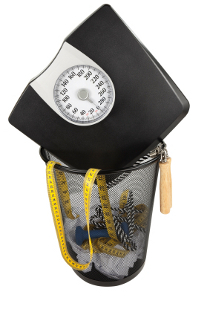 You might even use a scale or measuring cups to make sure that you're eating the right portion size. But, as time goes on, you tend to get less rigid, eyeballing portions instead of measuring. This could be adding extra calories without you realizing it. If you’re into calorie counting and you’re not sure how many calories you should be eating, you can easily calculate the amount with this calorie deficit calculator. This one blows people’s mind sometimes. They lose weight and keep eating the same way they did to lose weight, not realizing they're burning less calories now because they weigh less. If you go from, say, 200lbs to 170lbs, you’re body is using less energy to move that 170lb body during the day. You can’t eat the same amount of calories that caused you to lose those 30lbs anymore. Oh, doesn't that make you feel cheated! You lose weight, only to discover that you’re not burning as many calories. So, if you want to keep burning fat, you need to... eat fewer calories. You can check this out yourself with my Total Daily Calorie Needs calculator. Type in a few different weights and you'll see the estimated calorie intake changes. You would be amazed at how a weekend of overeating can set you back after eating “healthy” all week. More alcohol, bigger servings, more processed carbs (which brings on even more cravings which means even more overeating). Well, first of all, let’s clear something up: eating healthy doesn’t mean you’ll lose weight. That's a common misconception. "If I eat healthy, I'll lose weight." Nope. Remember what I said about calories. They count. It doesn’t matter if you eat too many donuts or too many bananas. If you eat more calories than your body uses, you will gain weight -- even if it’s “healthy” food. What I see happening often is people thinking they’re eating healthy when they actually aren’t. People will refuse a steak with roasted vegetables and instead eat a plate of “whole wheat” pasta with steamed vegetables and a tomato sauce, thinking it’s healthier. But it’s not. Eating processed carbs, like pasta, bread, cereals -- and making grains the star of the show -- can backfire in many ways. They’re not super-nutritious. And they can spike your blood sugar levels, leaving you with carb cravings. And that creates a vicious cycle. I’m not saying carbs are bad. What I’m saying is that sometimes our idea of healthy isn’t really helping us. And for most of us, that’s where we can make small changes that will have a powerful impact on a weight loss “plateau." There are so many things you can do to get the scale unstuck again. So many that you might find it confusing, overwhelming and you have no idea where to start. This is especially true if you keep hearing about all these “amazing” ways to lose weight, and everybody around you seems to be doing keto. On the flip side, it’s also easy to think there’s one little thing you’re doing wrong, and if you could just figure it out, the weight would magically start dropping off. So, you keep tweaking, tweaking and tweaking -- without focusing on the basics, and how much you’re eating. I say it’s time to get back to the basics. It’s time to make weight loss simple again. That’s my mission! Not sure what you want to change? That’s okay, too. If you tend to eat a lot of processed carbs and grains -- bread, cereal, pasta, cookies, chips, rice, etc. -- one change you can make is to cut down on these kinds of foods. Another way to get the scale moving down again is to change what you eat for breakfast and lunch. Focusing on a combination of fat and protein, with a lot of veggies, will help you cut down on excess calories in a few ways. These kinds of meals keep you feeling fuller longer (so no snacking). You’ll also get fewer carb cravings. So, you’ll be eating fewer calories. Did the words "eat more fat" trigger you? It still triggers me a bit but I'm getting over it. It took me a long time to add fat back into my diet again, after hearing for so many years that we "must eat low fat". If the thought of adding fat to your diet makes you nervous, check out my article about this: Why You Need to Add Fat To Your Diet. A weight loss coach can help guide you towards healthier eating habits, answer questions, help you to be more consistent -- and be your cheerleader. At least, that’s how I do things! If you’re picturing some kind of drill-sergeant, telling you what to eat and when to eat it, then STOP! That’s not how I do things. I’m totally focused on you. My style isn’t focused on proving to you how much I know. I’m all about helping you find what works for you, and encouraging you to do that. I’ll give you a little push if you need it or back off and help guide when things get tough. What's next? Take a deep breath, tell yourself you've got this and pick one of thing you can do to move forward. Don’t go looking for quick fixes to lose weight. Stay focused on the basics, keep it simple and make changes you can live with for the rest of your life.